Amid all the economic doom and gloom last year. 2011 still gave us some reasons to celebrate. 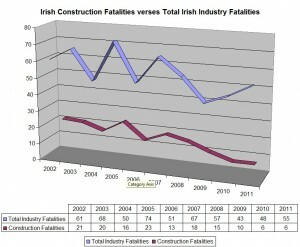 This is that Irish road accident and construction deaths plunged to new lows. Irish road deaths during 2011 were the lowest since records began in 1961. Even still, 212 people still died on our roads. The worst year for road deaths was 1972 when 640 people died even though traffic volumes were much lower. While improvements to our road infrastructure and cars have helped to prevent some deaths the biggest difference has probably been driver behaviour. The introduction of penalty points for driving offences and new strict drinking and driving laws has recently helped in this regard. Thankfully the yearly deaths within the construction industry are also trending down. Although the numbers involved are smaller, the reduction in deaths in recent years has been startling. The changes in health and safety regulations seem to have had an impact . The extra paperwork involved is a burden but with results like these it is worth it. The reduction in construction activity in recent years may have been a factor as well. See graph below, click to enlarge. It is interesting to note that while construction industry fatal accidents were once 35% of total industry deaths (2002) this has now dropped to 11% in 2011. The deaths occurring in industry are now concentrated in the Agriculture, Forestry and Fishing sector. It is shocking to realise that this relatively small sector alone accounted for 25 of the 55 deaths in 2011. Putting it another way 46% of all industrial fatal accidents in 2011 were from a sector that only employs 5% of the Irish workforce. It would seem that this section of industry needs to make improvements in working practices and follow the lead set by the construction industry. The HAS website goes into more detail with the figures and also shows a graph which relates fatalities to employment levels, click here for the link. Note. The figures used in this article were soursed from the CSO, www.cso.ie, and the HSE, www.hse.ie.